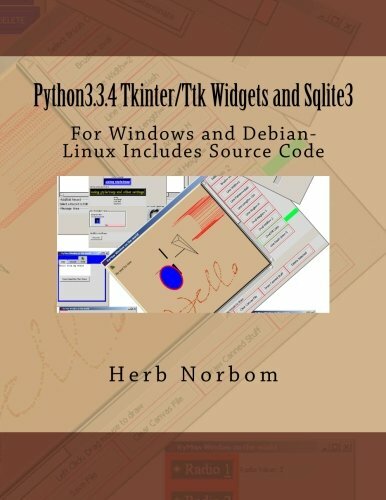 Fantastic book for working with Python 3.3, Tkinter/Ttk and Sqlite3. Rich examples are provided that give the reader the knowledge to use the GUI features of Python. The book is directed at the GUI Tkinter/Ttk and the use of the Sqlite3 database. The Tkinker/Ttk widgets have the ability to use Style and Themes for greatly enhancing your programs visual qualities. With the map feature you can quickly tie your visual representation to the actions of the user. Each example has a discussion section that goes into some depth on the features. A complete Python source code of the example is provided. If you are just getting started with Python's GUI you will find answers to many of your questions. If you are advanced you will find this book to be great desktop reference. The examples are written in as simple as possible Python code so that the reader can grasp the concepts of the "widget" or process. If you want to get your feet wet with Sqlite3 this book is a great starting point. Examples are provided that get your database up and running quickly. You will be amazed at how rapidly you grasp the Sqlite3 process. Of course examples are provided that use Tkinter/Ttk and Sqlite3 together. With the many standard features available in Python enhanced with the GUI and database your programs will become quite sophisticated.